I love buying these foam seasonal shapes from Michael's craft store. This week, I purchased some egg shaped foam pieces and I puffy painted different goodies on them. I decided to make three different memory games for the kids to play with when they finish their work early. The first set, I made using different antonyms for kindergarten. I picked words that they could sound out, or that are our sight words. All of the eggs would start facing down. The first player would turn over two and see if they match. If they find a match, that student keeps the pair and they can go again. Whoever has the most pairs at the end of the game is he winner! I made another set using sight words. With these, they will have to find two words that match. And this game is finding the number word and number that match. I made a worksheet that you can download for free on my TPT store. 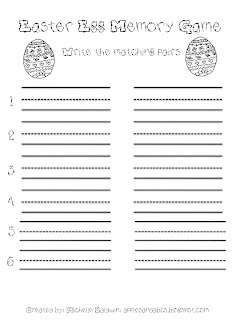 After the students match the eggs, they can write down all of the words on this printable. LOVE this idea!! I will be heading to Michael's today! Thank you for your creative ideas! That should have been a :)!!!!! Cute egg idea! I love your blog! You inspire me. I wanted to give you the Lovely Blog award. Go to my blog to see the rules. Too cute! I wish we had a Michaels!